Launderette Laundry Bags: Cleaning Up in Cranford, NJ! Laundry. Lots of it! Did you know that we do about two loads of laundry per day in our house? Yep. That’s life with twins plus one. I’ve struggled for a while to find laundry baskets that are both durable and decorative. Most are covered in ballerinas or sports balls, neither of which really match the style of my kids’ rooms. I settled on a fabric bin for Liliana’s room and splurged on a wire frame farmhouse style hamper for Landon’s room. Noah received Landon’s hand-me-down canvas hamper because it was better than most of the other options I’ve seen. We got so into a more efficient laundry process, that Kevin built a 3-drawer laundry basket cabinet for our mudroom. The problem, now, is that Landon can’t lift his wire basket high enough to make it down the stairs, Liliana drags hers by flimsy handles, and they have to take turns piling Noah’s soiled baby garments into one or the other. They thud their way down two flights of stairs and wind up throwing everything into a big pile on the floor. Why am I telling you all of this? Because Cranford-made Launderette laundry bags are the solution I have been waiting for! We met by chance, or maybe the laundry gods sent her to me. Roseann spends her free time perfecting her sewing skills mentored by business partner, affectionately, Mom. The talented duo match fun prints with functionable fabrics, like burlap and machine washable cotton liners. My favorite is the upcycled Mexican coffee burlap bag with attached carrying strap and subtle floral lining. Truly, the thoughtfulness doesn’t stop there! 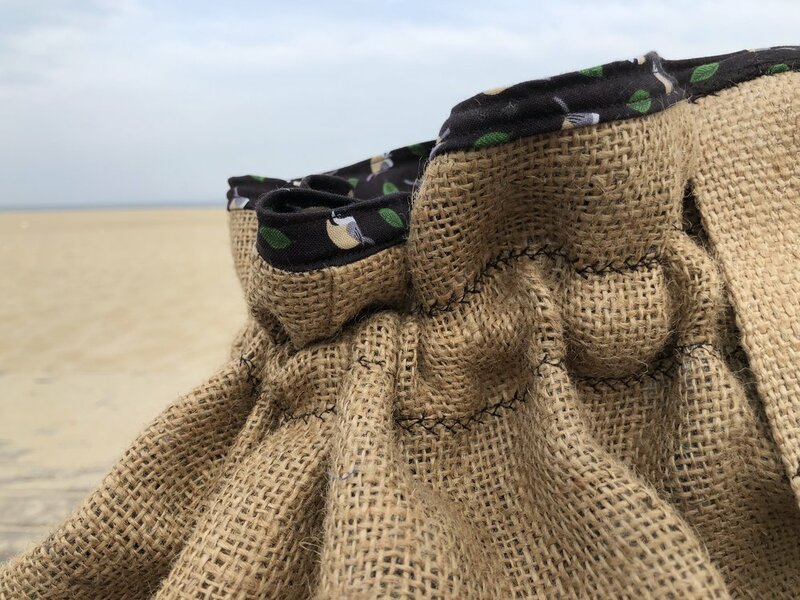 Each stitch contributes to an intricate leaf or cross pattern, the drawstrings are topped with handmade pom-poms and bows, the laundry bag fabrics range from custom nursery designs to pet and outdoor enthusiast themes. There really is no detail overlooked. The best part is that these bags double as beach duffels and multipurpose totes. They are lightweight but heavy duty – enough to support a full sized knit blanket and four luxury king sized bath towels. It is the perfect match for these messy little laundry monsters! If you have a chance to stop by The Marketspace at Summit next weekend, Roseann and Mom will be debuting their line of laundry bags, aprons, and other fun creations. I adore their drive and entrepreneurial spirit. They are proof that you always have time to carry out your dreams!